Kerala's most powerful Marxist speaks! 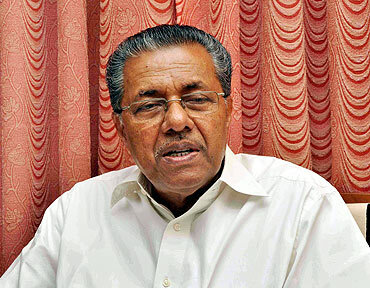 Pinarayi Vijayan is a name not many Indians are familiar with, but few state leaders have such a strangehold over their party as the secretary of the Communist Party of India-Marxist's Kerala unit has. Can you think of the leader of any other state political unit preventing his party's chief minister from getting a ticket to contest an assembly election? That is what Vijayan reportedly did when he and his supporters in the CPI-M's district and state committees in Kerala ensured that Chief Minister V S Achuthanandan -- with whom Vijayan has had a feud of long standing -- did not get a ticket to contest next week's election. Even CPI-M General Secretary Prakash Karat -- a Malayalee -- had to go along with Vijayan's diktat. Only when CPI-M activists on the ground demanded that Achuthanandan be given a ticket did Vijayan finally gave in. This was not the first time that Vijayan has tried to outpoint his adversary; in the last election too, Achuthanandan -- who, like Vijayan, is from the Ezhava caste -- was denied a ticket till the CPI-M rank and file rebelled and demanded that The octogenarian be allowed to contest the election. Achuthanandan won and has ruled Kerala for five years. In an exclusive interview with Rediff.com's Shobha Warrier, Vijayan -- a member of the CPI-M Politburo -- breaks his silence about his tiff with Achuthanandan. Please click NEXT to read the interview. Industrialists are scared to come to Kerala. Have you done anything to change that image? I must tell you about the PSUs (Public Sector Units) in Kerala. All of them were sick and the UDF (the Congress-led United Democratic Front) was planning to sell them. That was when we came to power. Now, all of them are making profits. How? That is because of our pro-industry policies. With the profits, we started eight more PSUs. This is at a time when shares of PSUs are being sold all over the country. Have you heard of any state starting a new PSU? I was not talking about PSUs. I was talking about private enterprises. Is the CPI-M against private industries? Not at all. In today's circumstances, along with PSUs, you need private enterprises too. The CPI-M has not taken any decision that is detrimental to private enterprises. We believe that we have to encourage private enterprise if they are for the good of the country. Nobody can say that an enterprise faced difficulties because of trade unionism. Today, no trade union takes a stand that affects the performance of companies in a negative way. Once, the chief of Reliance had said his company received good cooperation from the workers here (in Kerala). 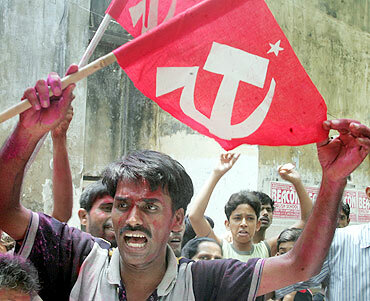 Has the CPI-M taken a decision to educate the unions? The party has not taken any such decision. The trade unions are themselves more aware now. Today, the trade unions are not taking the stand they had taken decades ago; it has changed. Trade unions now believe that the stability of a company is for their own good. Ten years? We ruled only for five years. We signed it now taking into consideration the interests of the state. One of their demands was that there should not be any such IT parks near Smart City and the UDF had agreed to that. If you look at the agreement now, this clause is not there. At that time the Info Park near Smart City would have to be under their control and we had objected to that clause. We have signed the agreement keeping in mind the interests of the state. Kerala has been alternating between the LDF and UDF because the people are dissatisfied with the performance of both governments. This time, the people of Kerala want continuity in the government. They feel that only then will the initiatives taken by us move forward and the state will progress. So, there will be continuity and we will come back to power. What is the place of the Left in this globalised world ruled by capitalists? When the Soviet Union collapsed, there was talk that it was the victory of capitalism and that only capitalism and colonialism would finally succeed. Because they had 95 per cent of the media under their control, the news was widely circulated. At that time itself, we had said it was a transient phase and ultimately socialism will emerge the victor. Image: Will Kerala voters endorse Chief Minister V S Achuthanandan again! Why did an ideology that spoke about the upliftment of the downtrodden fail? It has not failed and it will not fail. Why have many people started talking about the Left ideology and socialism after the economic meltdown that happened in the US? What happened in the West was a major problem that the capitalist countries faced and they are yet to recover. Even in the US, those who lost their jobs and those who felt for them have started reading Karl Marx. This proves that the relevance of Marx will never fade. Ultimately, only socialism will win and it cannot be otherwise. Even in the so-called developed countries, millions of people participated in protest rallies against capitalism. Why do you think it happened? 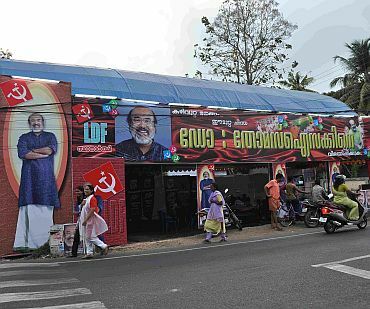 Is the Left Front in Kerala against capitalists? For example, if the Ambanis want to start an industry here, will you welcome them? Today, the Indian government follows one policy. We can also function only within that framework. So, when such industries come to Kerala, we also take a decision to let them come. It is also important for the development of the state. But if it is against the interests of small-scale industries, we will be against any sort of capitalism. We are not against anyone starting an industry in the state. According to you, which are the major issues this election? The major issue, of course, is development. When the LDF government came to power in 2006, Kerala was in shambles in all sectors. But we made excellent progress in all sectors. The people of the state want continuity in the development work we have started. 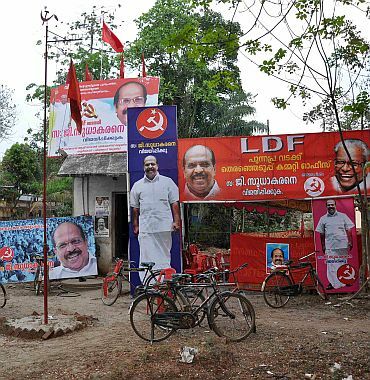 People know it is possible only if the LDF comes back to power. Can you specify a few sectors in which you have made progress? Take the agriculture sector. As many as 1,300 farmers committed suicide when the UDF was in power, but they didn't do anything. After we came to power, not a single farmer has committed suicide in this state. You should remember that farmers are committing suicide even now in other states. How did we manage to stop this? We set up a debt commission and on its recommendations, wrote off all the debts. We saw to it that all the families (of farmers) which suffered were given special help. We also gave interest-free loans to the farmers. When nationally the agricultural growth was negative, we have achieved 2.8 per cent growth. There was a time in Kerala when almost all the intellectuals, writers and artists supported the Left. Not any more. Similarly, the youth of Kerala are not attracted to this ideology any longer. Why do you think such a change took place? You are wrong. Such a change has not taken place. Such a notion has been publicised by those who want to destroy the Left. One way to attack us is by giving us the image of an extreme Left. By projecting our party as extreme, they attack us. There are a few who have become Left extremists; but by pointing them out, you cannot attack the ideology. About the youth not getting attracted to the ideology, you are wrong. It is still the same and the situation has not changed at all. Both the SFI (Student's Federation of India) and the DYFI (Democratic Youth Federation of India) are very strong. But we agree that we have to be careful because there is a constant effort to spread non-political feelings across the state, especially among the youth. Our society is politically active because of the Left. Should students in schools and colleges be politically active? When an 18-year-old can vote, shouldn't he or she be politically aware and active also? What is wrong with young adults being politically active? They shouldn't be scared of politics; they should be a part of the political process. Studies and politics can go on together. But the politics on the campus leans towards the Left. That is why many are up in arms against campus politics. Will the 2G spectrum issue be an issue in the Kerala election? Corruption at all places will be an issue. The spectrum scam will also be an issue because it shows how corrupt the Congress party is. But here in Kerala, there are many other local issues like the cases against (Indian Union Muslim League state general secretary) P K Kunhalikutty, (former power minister and Kerala Congress-B leader) R Balakrishnan Pillai and (Congress leader) Oommen Chandy. People are aware of all that. On the other hand, we have kept aside Rs 40,000 crore for infrastructure development and Rs 7,000 crore for developmental works for women. One issue that has made headlines is the feud between you and V S Achuthanandan. It is the product of the imagination of a few persons in the media. I vehemently deny that there is any fight or disagreement between us. But he was denied a party ticket for the assembly poll and then given one after protests by local party workers. It was reported that you didn't want to give him a ticket. (Laughs) There was only one list from our party and in that list, his name was there. Also, the rumours started floating around while we were finalising that list. How did the media get such a report when none of us spoke to anyone? Why is it that both of you are projected as competitors or enemies and not as comrades? There are many here who want to weaken the Left Front. That is why these people work overtime to malign the party. They think by spreading such stories, the party will weaken. You have alleged that some people are bribing the media with money so that such stories appear. In this programme to malign the Left Front, there is a management led by a certain corporate sector. A media person can't function when the management is against us. Sometimes, some media personnel are bribed and used (against the CPI-M). I am not saying all journalists succumb to this, but some do. We have seen that such bad elements are used by those who want to destroy us. We never announce the chief ministerial candidate. After the win, we immediately elect the chief minister. How will you rate V S Achuthanandan's performance as chief minister? We look at the government's performance in totality and if you look at it that way, it has been very good. If you go to any household in Kerala, they would have received at least one benefit from the government. We have done many things that are beneficial to the people. Will Pranab's son change the face of rural WB?